The Sorrento™ is clinically designed for the individual who requires pressure management, postural support and most importantly, comfort. The Sorrento chair has now become our most popular chair as it embodies, comfort, relaxation and a feeling of ease for its users. It provides comfort and support as it is very easy to use and will provide long term benefit to the user. 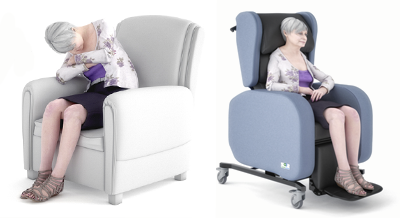 The chair has been proven to reduce pressure, prevent sliding and falls from the chair and encourage early mobilization for bed bound patients. It is used widely in hospitals and rehabilitation units. Tilt in space can be used to improve posture and redistribute pressure. This can also be converted to include forward tilt for rehabilitation or in self transferring situations. The adjustable back recline will accommodate users with limited hip flexion and when used in combination with tilt in space it can prevent sliding from the chair. Optional lateral supports and supportive pillows can help to maintain or improve posture and facilitate functional ability in activities of daily living such as eating and communicating. The correct use of these features and accessories can also reduce common problems such as falling to the side when seated. Valerie previously sat in an standard wooden frame chair. However, her posture improved immediately after being seated in a Seating Matters Sorrento™ chair. Three soft, fibre filled, Dartex covered support cushions on the back of the chair that can accommodate abnormal spinal postures such as scoliosis and kyphosis while improving comfort. They can be moulded and adjusted to suit specific spinal presentations. A unique combination of lateral fibre filled support cushions with a horizontal head pillow. This positioning can gently accommodate kyphotic or scoliotic postures and prevent falling to the side while facilitating comfort. Each of the support cushions can be moulded and adjusted to suit specific patient presentations. Helpful for clients whose legs abduct and externally rotate. They protect the feet from injury or objects in the path of chair movement. They also help to keep the feet supported on the footplate. The leg rest wedge helps to elevate the clients legs further. For more in-depth information on all the SORRENTO™’s features, dimensions and specifications, please feel free to download the operational manual. The descriptions included on this page reflect common features of the Seating Matters chairs. As features and specifications vary in different parts of the world, please refer to your local Seating Specialist to confirm the exact specification in your area.